For the many who have inquired, this mural is available for purchase Here. In a recent visit to Magdala the students of the Jerusalem University College were graciously and expertly hosted by the excavator Arfan Najjar and Jennifer Ristine. I like to visit Magdala for two reasons. One is to visit the antiquities of the First Century Synagogue and the Second is to reflect on the role of women among the first followers of Jesus. The Encounter Chapel is first of all an archeological treasure: the floor is that of the original first century market place of the Magdala port. A port market place is about as busy a spot in any town you can imagine – probably the main metro train station or airport in our terms – where people without any discrimination rub shoulders. Since we have also discovered significant infrastructure for fish processing, it is most logical that fishermen of the Sea of Galilee, many known to us by on a first name basis, who wanted to sell their fish for export to Rome (documented by Flavius Josephus) would have gravitated to Magdala’s port, probably not unfamiliar to Jesus’ fishermen disciples. Jesus´ ease at sitting in their boats and mingling with large crowds helps us to see many people encountering him in this marketplace and he can engage the workers and the traders. The large painting (titled “Encounter”) gives us a snapshot of the encounter of the hemorrhaging woman who tries to touch Jesus for healing (Mark 5: 25-29). The Encounter Chapel, in the lower lever of Duc In Altum, is dedicated to Jesus’ encounter of all of us, as illustrated by the hemorrhaging woman. 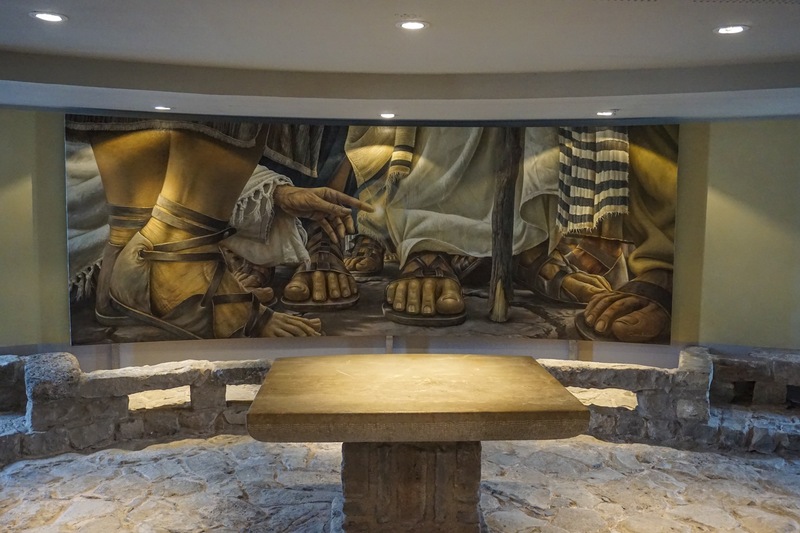 Located on the marketplace of the first century port, the Encounter Chapel is modeled after the structure of the Magdala First Century Synagogue with room for up to 120 people. As you visit the Sea of Galilee and reflect on Jesus’ ministry in the area, I commend to you a visit to Magdala—about 1 to 1.5 hours so see it all. This entry was posted in Churches, New Testament, Places in Israel, Synagogues and tagged Duc In Altum, Encounter, Encounter Chapel, Hemorrhaging, Magdala. Bookmark the permalink. I heartily agree Carl and for the same reasons. A wonderful opportunity as well to reflect on the importance of Mary Magdalene (without the overlays of Dan Brown!) in the early Jesus movement. Our group will be there June 8. I would love to have a copy of the encounter mural but do not know the name of the artist or where I might purchase a reproduction of it. Can you help?